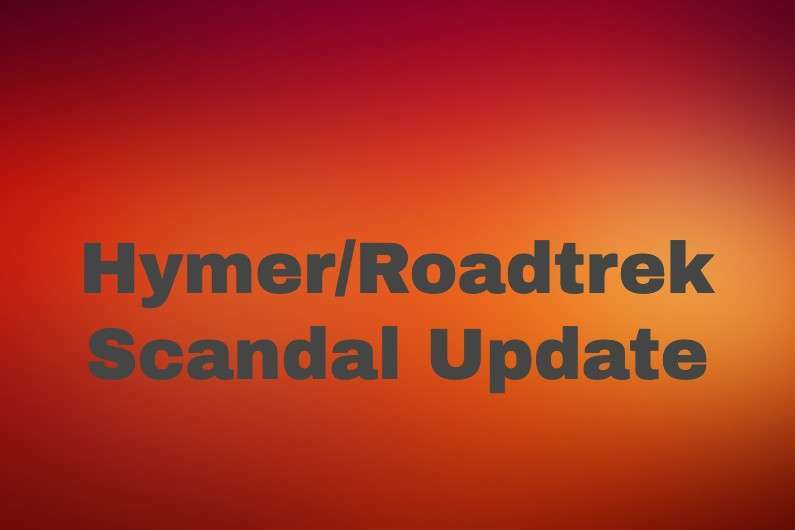 I have promised an update on the scandal and disturbing news about financial irregularities swirling around Roadtrek motorhome's corporate parent, the Erwin Hymer Group of North America. Here's what we now know. The blockbuster news is that the North American operation as of today has been excluded from Thor's plan to purchase the Erwin Hymer Group (EHG), whose worldwide operations are headquartered in Germany. That is a huge development. Here's how this has unfolded. EHG formed a separate North American division – Erwin Hymer Group North America (EHGNA) – that included Roadtrek when it purchased Roadtrek Motorhomes some three years ago. At the time, the company announced plans to expand in North America, with new Hymer-specific vans as well as European-styled travel trailers and perhaps even larger motorhomes. Hymer vans like the Activ were introduced. The company added some other brands like en entry level priced van called the Carado. After a slow start, a line of ultra light weight towables – the Hymer Touring GT – was introduced. EHYNA seemed to be exploding with new models, new technologies and massive growth. Then, this fall, Thor Industries based in Elkhart, IN announced that it had reached an agreement to but the entire worldwide Erwin Hymer Group and all its operations, including the new North American division. The deal would make Thor the largest RV manufacturer in the world. All seemed to be moving well with that, until earlier this month. In preparing a financial audit of the North American operation for the sale, Hymer accountants discovered extremely serious financial “irregularities.” News reports unconfirmed by EHG but so far undisputed by the company allege that they involved false invoices paid to family members of key managers, falsified titles, inflated sales figures, inventory discrepancies and other problems totaling between $70 and $100 million. Expand the company did, from just over 300 people when Roadtrek was sold to EHG three years ago to nearly 1,000 employes last week. Besides the new Hymer models and the towables, a new Jeep camper company was acquired. A huge new factory in Cambridge was remodeled to supplement production from the aged Kitchener Roadtrek factory. The company appeared to be booming with success, as repeatedly trumpeted by its charismatic, outspoken President and CEO, Jim Hammill. Second-in-command was Hammill's longtime friend, Howard Stratton, who was named Chief Operations Officer. Stratton then appointed several of his relatives into key management positions. Together, the two painted a rosy future for the Class B manufacturer. Hammill was always positive, always pointing to the rapid growth as a measure of EHGNA's great success. But the irregularities uncovered by the audit made that success seem like a wild pipe dream. Last week, nearly 100 of the newest company hires – those hired less than three months ago – were summarily fired and walked out of the company. Word soon leaked out that the top managers had been immediately sacked, as well. Hammill was suspended. So was Stratton. Reports are that Stratton was physically escorted out of the building. Hammill, who was out of the office on sick leave was reportedly home at the time he was notified of the suspension. In an internal statement sent to EHGNA employees this morning, signed by two EHG worldwide CEO Martin Brandt and CFO Stefan Junker, the company confirmed “several managers” have been suspended as a result of the investigation but dd not specify who they were. We wish to inform you about recent developments in our company. Erwin Hymer Group (EHG) is currently reviewing the business of Erwin Hymer Group North America (EHG NA). An initial investigation has shown irregularities in the company’s reporting. We have initiated a detailed audit procedure involving external auditors. Erwin Hymer Group is acting in accordance with its zero tolerance policy and is committed to a full and complete investigation. Thor Industries has announced that it expects that the purchase of Erwin Hymer Group will be completed within the company's fiscal third quarter ending April 30, 2019. Due to the ongoing investigation, Thor Industries and EHG’s selling shareholders are finalizing discussions to exclude EHG's North American operations from Thor's purchase of EHG. We are fully aware that this news generates unease and raises concerns. It is our objective to keep uncertainty as low as possible and we expect to have a full assessment of the situation in the coming weeks. We will inform you on further developments. Please be assured that we are doing everything we can to minimize any potential impact of this situation on our customers, business partners and employees in North America. Similarly today, Thor has also issued a statement of its pending acquisition of the Erwin Hymer Group that pointedly noted that their offer has been revised to exclude the North American division from its purchase. Thor is a huge, multi billion dollar RV company based in Elkhart, IN, with numerous brands and divisions. It's America's biggest RV maker. It said it hopes to complete the EHG purchase by the company's fiscal third quarter, which ends April 30. “The revised terms are expected to include, among other things, both a reduction on the purchase price and a reduction in the obligations the Company would have otherwise assumed,” said the Thor statement. This is a huge blow for Roadtrek and the EHGNA. I just returned from the Tampa RV Supershow, where both Roadtrek and EHGNA sales and support people were displaying and selling new models. The team there was tightlipped about discussing the scandal swirling around the company, but you could sense the tension and worry. They have families to support and mortgages to pay, yet they put those worries aside and were working very hard to sell the beautiful new vehicles they were displaying. It was doubly challenging for them because some of their competitors at the show were delighted to point out the company's difficulties to shoppers. Late on Friday, Greg Gerber, editor and publisher of RV Daily Report, broke the story of the scandal. That story instantly rippled across the Florida State Fairgrounds and was immediately seized upon as a perceived sales advantage by some sales people from competitors. It was very sad. Then, today, Monday Jan. 21, came the Thor press release and the EHGNA employee letter. So…bottom line…. what does this mean for Roadtrek? I honestly don't know. I am sure there will be widespread industry speculation and more rumors. It would surely help if EHGNA would explain the situation better to its employees, customers, suppliers and those who have deposited money and are expecting new vans to be built. I am sure they have to be very careful about what they say while an investigation is underway. I get that. But I also know that with a lack of facts, rumors and speculation can make a bad situation much worse. I am not an employee of EHG or Roadtrek. I have been an on-the-road ambassador for Roadtrek as we've traveled the country and reported on the RV Lifestyle and they have been one of our sponsors. They have had no editorial control over this blog or our social media reports and they have never interfered with anything I have reported. Their relationship with us has been that of a sponsor only. So I have no first hand knowledge of what is going on there. My info comes from friends who work there and what has been on the public record. I do know from my sources that today, the factories in Kitchener and Cambridge are open, vans are still being built, expenses are being trimmed, possible layoffs and furloughs are being considered and a team of accountants and auditors are going over the books in an effort to find out what went so very wrong and why. And everyone is wondering…. what's next? Keep us updated when You get any info, and thanks for the update. This was helpful Mike, thank you. Just took my 2018 Simplicity to La Mesa RV in Mesa Az for warranty work. They are refusing to work on it due to invoices not being payed. I called Hymer and was told the only option was to pay put of pocket and send them copies for reimbursement. Same thing has happened to me at RV World in Nokomis, Florida. I was advised to pay out of pocket for the warranty work, then see if Roadtrek will reimburse me. I’m on the fence on whether to wait this out in hopes that the dealer warranty work will resume soon, I’m looking at over 3K of out of pocket. Yeah well, we “submitted” in October and still have nothing. Exactly what I am worried about also. Yes, I want to know any updates when you get them! Thanks! Thanks Mike. I hope those at the factory know that we are all thinking of them and wish we could do something to help! All the employees at Roadtrek have been utterly amazing any time I have had contact with them. Yes,our thoughts and prayers will be with these fine folks…so sad. So sorry all this has happened. Does this mean warranty will be void and any repairs to CS Adventurous will be out of pocket costs? As a leader in the community, I suggest the regulators are contacted and the sale blocked until there is clarity around honoring warranties and compensating owners for loss of value. The regulators would include US Federal, Canada Federal, Ontario, Indiana, and EU. If the acquisition approval is put on hold by an outpouring of Roadtrak and Hymer owners then provision will have to made to make owners whole. Plan for the worst and hope for the best. With no leadership and no Parent I do not see how the US ops can hold up without a substantial cash infusion. Thank you Mike for this report of the knowns, unknowns, and known unknowns about RT, EHGNA and Thor. Personally, I was anticipating a fact-based report from you such as this earlier (even when there were fewer “knowns” and many more “unknowns”). However, kudos on this story and hope you will promptly update as more info becomes available both from the players and your sources. Keep up the good work. Hi Mike, this is the most comprehensive article on this matter I’ve read the past few days. Terrible for the company and their employees and those recently let go. Even if Jim Hammill wasn’t involved, as the CEO, he has ultimate responsibility. We’ll see how all of this plays out. I am anxious to see how this progresses. Thank you for a frank discussion of known issues. It is refreshing to see a news report that isn’t full of sensationalism, but is a factual statement. I echo what you say, David. I knew nothing about this until I opened email today. I appreciate the excellent news report. Hate to be negative but financial mismanagement of this sort (if it did happen) is devistating to a company. It will take several years to recover if they don’t go bankrupt. Thank you, Mike, for your comments and some clarification for us. We have heard so many rumors that we appreciate your insight and will continue to look for more updates on this situation. As Road Trek owners it is very important to us to be informed. Mike: Thank You for your report. We have always perceived that you are indeed honest and forthright in your reporting. We look forward to further updates. Mike: Thanks for the info. Having been involved in a couple of acquisitions or mergers in my career these type of things come up while the purchaser is doing their due diligence. Hopefully the Roadtrek brand will continue. I never understood your relationship with Roadtrek and I still don’t. Does “they have been one of our sponsors” and “Their relationship with us has been that of a sponsor only” mean they pay you or give you a free Roadtrekreoadtrek? Or They sponsor your trips and you get to expense the places you stay? Just trying to understand your position with the company. I have NO position at the company. Period. I have always been upfront about being sponsored by them, which includes the use of a vehicle. Roadtrek/Hymer has at least two other couples they have similarly sponsored, as do other large RV manufacturers here and abroad. Roadtrek has sponsored us, as has Verizon Wireless, Rad Power Bikes, and various other companies who pay us an advertising fee on the podcast and blog and our various online publications. I work 60-65 hours a week in doing our various reports. This is not just a hobby for me. It is also my business. I found your response to Rachel’s question defensive and disappointing. While you were upfront in your article about EHG’s sponsorship, you did not disclose until Rachel asked that this includes free use of a Roadtrek that retails for well over $150,000. This makes your insistence of having no “position” with the company a bit disingenuous, since you obviously are receiving significant economic benefits from your relationship with them. As a journalist, surely you recognize that this creates a conflict of interest that you should fully disclose in your reporting. That said, I think your article was balanced and well done. Mikes response. It’s been no secret that he has been sponsored by Roadtrek all along, and provided honest positive coverage of their product in exchange. Would you expect a NASCAR driver to criticize Chevy or Ford if they sponsored him? I give him credit for speaking up. Thanks for the update. But let’s call this what it is….these are not “financial irregularities”, this is fraud and extortion. Neal you can’t make that charge are based on just news reports quoting unnamed sources. The auditors are the only people who know what those irregularities. Until their investigation is complete, you do not have enough facts to say that. So let’s wait until they report their findings. No, lets call this what it is, rumors. None of the official statements say anything about “financial irregularities”. They use the term “reporting irregularities”. Which also fit the rumors a lot better. We have rumors of ghost sales of ghost units. Of “sold” inventory being hidden when someone comes to count. If you make a sale of a non-existent ghost unit to a non-existent ghost buyer what do you do with the ghost cash you get in payment? Get it off the books by paying it to a ghost employee or ghost vendor. Inflating sales figures is dishonest and might be legal fraud depending on the circumstances. But it is not extortion. Thank you,Mike, for the info. Thank’s Mike, for the best info yet. Thanks for the update Mike. Readers should note that the alleged irregularities are with EHG NA, NOT Roadtrek, a subsidiary company. Roadtrek essentially became EHG NA. It is not a subsidiary. Roadtrek is essentially a nameplate of EHG, not a separate company. The executives of Roadtrek became the executives of EHG NA. I was worried and sad when they became partners. Roadtrek is wonderful. Thank you – – appreciate the info, and hope you’ll continue as you know more. Thank you, Mike, for keeping us informed. You have always been above board with us and honorable in everything you do. It is much appreciated. Jim Hammill is a good man who has made Roadtrek a leader in the industry and offered his customers the best in customer service and innovative products. I find it very hard to believe he is guilty of anything more severe than trusting his friend. Mr. Hymer will continue to own the North American operation while all this plays out. He and Jim have a good relationship. I pray they can work this out. We have had a CS Adventurous XL on order for 17 months and have been told it could be not until June before we get it. My wife and I have a big decision to make regarding whether to cancel or not. This sounds very strange. A 17-month delay on delivery from your date of order and now they say you won’t receive your new CSA until June??!! Suscpicious at the least. Are there others out there who have had to wait 9 months or more for delivery of a new Roadtrek? Almost all Class B RV makers are taking a long time for orders right now because so many people are buying Class Bs. Add to that the difficulty all Class B makers have in getting Sprinter chassis from Mercedes Benz and 8 to 10 months waits are not that unusual right now for new builds. Does your contract have an escape clause….like many of these types of irregularities….you won’t like the outcome….IMO I would get a refund and move on to another coach…. Mike, I was going to buy a Carado Axion Studio, an entry level Dodge 1500 Ram, with a pop top, and a small Lithium 400 system. Can you please get back to me and tell me if I even have a remote chance of buying this vehicle someday in light of this scandal? I see no reason you can not do so. They are still building and selling vans! Ron, I do not work for the company and have no information other than what I have reported. I can only say to just give the company time to complete its investigation. Then we can hope they will release some sort of report or statement that answers all the questions people have. Not at the Kitchener location. I just quit. Last week. And my bf still works there. They were told to stop building and do inventory and clean out their lockers. Thanks Mike you are a quality person and I am thankful for your voice. Thanks For the update Mike. We took delivery of our Simplicity in September, I hope Roadtrek honors the warranty. Please provide updates when you can. Chuck, Roadtrek and Hymer have always stood behind their products and I have no reason to believe anything would change, now. Thanks again for your excellent journalism reflect throughout this story. Do you have any thoughts or suggestions for Roadtrek owners who are understandably concerned about how to ensure our 6-year RT warranties will be honored? I would guess the ultimate guarantor is Erwin Hymer Group Europe. Do you concur? Would you suggest concerned owners such as myself begin writing letters to both to EHGNA and EHG Europe re: untinterruptef warranty coverage through the end of existing warranties, or perhaps some other action? Some dealers are always looking for ways to avoid warranty work. Contact the manufacturer. I have had experience with a/the Roadtrek dealer in Bend, OR. To keep it simple and straight forward: They run a “shady” operation at best. Based on my personal experience with having my Roadtrek in their service bay….STAY AWAY. They did you a favor by not attempting to service your unit. We are supposed to pickup our new aktiv 2.0 loft at the end of the month. Do you feel that the 6 yr. warranty is going to be compromised by this latest news? I have no information other than the story I have reported. I do not work for the company and they are not returning media calls or offering any more information other than what has been reported. That said, I see no reason to believe they would not honor them. Hopefully when the audit and investigation is complete, they will be more forthcoming with information. Has anyone at Roadtrek actually told you anything about your likely future relationship with the company? Or are you up in the air waiting to see what happens like the rest of us? It seems to me people are looking to you for certainty when you really don’t have any yourself. Its fine to say your relationship with Roadtrek is that they are one of your sponsors, but they have clearly been a very big one. I would think you have a big stake in their future plans just like those of us who are employees, dealers or owners do. I was watching Hymer before they came to North America. Their RVs in Europe are very innovative and their introduction into the North American market has moved the whole industry forward in many ways. Their acquisition of Road Trek was a logical move which if done properly was in the best interest of Road Trek and the RV public. We purchased an Aktiv and have been very happy with it. For the sake of the Hymer employees, owners and the future of the industry I hope this is just a bump in the road and not the end of the road. Thanks for the update and as much explanation as was given. On a side-note, though I haven’t checked/kept up to date on it; I *think* Greg Gerber sold RV Daily Report a few years ago so even though he continues reporting, he is not the official publisher any longer (possibly irritating the owner/publisher by the correct information not being reported). Gerber has recently re-acquired RV Daily Report from the folks to which he sold and is once again the “Publisher”. Greg Gerber has re-acquired RV Daily Report from the folks to which he sold. He is once again the Publisher of RV Daily Report. I talked to a dealer today. The sales manager said they received a letter from Hymer NA yesterday with just about the same info as in the letter to the employees. I can understand Hymer’s problem in that they don’t know how deep the problem goes. Therefore they can’t put out anything until they have all the info. Well THOR strikes again, this will be the same situation wherever Thor has put their name quality is kicked out the door in favor of more profits. Thor apparently had a management change in the last few years, our daughter and son in law have a 5 year 5th wheel made by Thor, it is a quality unit, there is another new Thor 5th wheel here in the park the owner says is a piece of crap. Other RVers that have different brands owned by Thor say the same thing. Unlike Midas that turned everything to gold, Thor turns into crap. Thor doesn’t own anything Hymer yet. We purchased a Hymer Sunlight last February. Surely hope warranties are honored. I am new to RVing. I actually bought my 2018 Roadtrek CS XL largely based on the fact that since you had a Roadtrek, had videos, podcasts and obvious experience and knowledge it must be the best brand to purchase. Very naive of me to not know you were given the units you used. You said you turned your unit back in to Roadtrek last week and now you are shopping for some other brand to buy or rent. If it was the best 6 months ago, why are you not buying a Roadtrek replacement now and indicate that you have no longer have any relationship with the Company ? Very disconcerting to say the least. I hope they don’t go bankrupt and continue to honor my warranty. I don’t blame you but I hope I did not make a huge mistake. Roadtrek’s USA/Canada operation began a downward trend soon after the Hymer takeover, driven by efforts for larger market share. Because of Roadtrek’s past reputation, I bought a new Simplicity SRT. Despite some well-intentioned inovations, like underhood generators and sophisticated battery systems, the unit failed to match the benefits claimed in over-hyped marketing campaigns. The result, trading for another brand after less than a year of use. The unit was rolled out to dealers and salesmen who lacked the training needed to explain operation of the on-board features. The owners manuals included facts and illustrations for earlier models, or for components other than those installed on the unit actually delivered. After repeated calls to sometimes confused customer service reps, I learned the underhood generator falls about 20 percent short of providing the capacity to drive the roof air conditioner, thus requiring shore power hookups to prevent dead house batteries. None of these use limitations were outlined in the colorful marketing brochures or the operating instructions. Complaints about the unit not meeting its marketing hype, led to customer service reps reminding me that the Simplicity SRT, after all, was an “entry unit,” and thus was a victim of excessive expectations. Actually, most RVers may have a high expectation, but Roadtrek still has a responsibility to provide fair and accurate information that allows the customer to make an informed decision about Roadtrek products. I talked to another dealer in the Las Vegas area and they want warrantee work paid by the owner and then the dealer will reimburse the owner if RoadTrek pays them. That’s three dealers now that are hedging against nonpayment by RoadTrek. All of the La Mesa RV locations in AZ are only doing warranty work on units bought at their individual stores. Per Roadtrek (Mac in warranty service), I will have to pay out of pocket and submit receipts to Roadtrek for reimbursement. La Mesa RV will not even try to bill them. So if you are traveling and have a warranty issue, good luck. I am considering consulting an attorney to see if there are any other options. keep us informed on the attorney, thought that might be a good idea myself. Will do. I’ll probably wait to see if Roadtrek reimburses me for the repair costs first, but I see this being a huge problem for anyone that owns a Roadtrek at this present time. I spoke with two attorneys today and was told that since part of the issue is in Canada, they cant take a case on this type of issue. We have to wait until the dust settles. They are doing an audit. The numbers that have been given as to the number of units seem high. Roadtrek is small, they could not have falsified that much without it being noticed. Was uncovered no doubt as due dilligence was being done before finalizing the purchase by Thor. Time will tell. I have been involved in the due deligence process and that is why they do it. Whoever owned the Hymer Parent in Europe (for example Hymer Family or stockholders) still owns Hymer No America because it was not sold to Thor. IMHO, that owner(s) continue to have the responsibilities from it’s latest customer contracts and the contracts customers had with RT before the purchase. BUT, who is that? Was it wholly owned by family, closely held by a few, or publicly traded? From this news release it appears it had Hymer family. They still own Hymer No America and they own it’s oblibations. Not sure about the reporting irregularities. I get an error. The web site must be shut down? Thanks for your article with the best knowledge you have. I have always enjoyed your articles and “how to” videos. Keep up the good work – it is appreciated! On Feb 4 Thor announced completion of acquisition of EHG minus EHGNA. I was hoping the regulatory authorities would block the acquisition until the issues with EHGNA were resolved and could be included. Thus it seems EHGNA will rapidly go bankrupt and owners of Hymer Group NA vehicles will be out of luck. Can anybody see any glimmer of hope?